Jay Z is finally free of a copyright-infringement lawsuit that was brought against him and mega hip-hop producer Timbaland in 2007. A Los Angeles judge dismissed Osama Ahmed Fahmy's case, which claimed that Timbaland and Jay Z illegally sampled the flute notes in his uncle's song for their hit "Big Pimpin,' " the Associated Press reports. Fahmy's uncle Baligh Hamdi, now deceased, was an Egyptian composer. The U.S. district judge threw out the case after hearing expert testimony from people who study music composition. Fahmy's attorney, Pete Ross, says he plans to appeal the decision: "We think it's completely wrong, and we'll appeal." Both Jay Z and Timbaland testified in the trial, which lasted about a week. They both maintained that they thought they had a legal right to use portions of Hamdi's song. In fact, Timbaland paid $100,000 in 2001 to settle an earlier claim about his use of the song. Jay Z is no doubt ecstatic about the resolution. 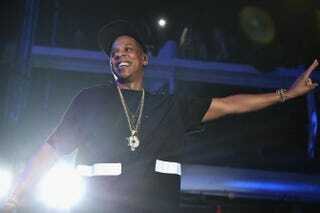 "My client is pleased with and gratified by the decision," Andrew Bart, Jay Z's attorney, said.